Dave Ramsey has become very popular by educating people about how to handle their finances. One of his main topics is teaching people to stay out of bad debt. Dave teaches to keep your credit cards paid off and to focus on paying off your house. I have friends who follow Dave Ramsey’s financial rules, and some of those friends think I’m crazy for the amount of good debt that I have on my rental properties. I spent a lot of time thinking about Dave Ramsey’s philosophy and I completely believe in his teachings. I think it is specifically beneficial for an audience who has not had any financial advisory education. The majority of the American public goes through elementary school, high school, and even college with without having anyone really teach them how to handle their own personal budget and how to live within their means. For that reason, Dave Ramsey’s seminars and books are an unbelievable asset to all of us. While some of my friends give me a hard time for the amount of good debt I have on my rental properties, I firmly believe in the philosophy of using other people’s money to build your own wealth. I have always been the type of person who tries to focus on keeping my credit cards paid off and living well below my means, but when it comes to buying investment real estate, I’ll be the first person in line to use bank financing to purchase a rental property that will provide me positive cash flow every month. I consider this type of investing to be good because it that allows you to invest in something that provides you a source of income while you’re paying off the debt and a substantial source of income after the debt is paid off. It’s important for me to educate people on the difference between good debt and bad debt. The good debt can help you achieve financial freedom. There are several details that need to be addressed. Unfortunately, it’s not as simple as saying any debt on real estate rental properties is good debt. You have to take several things into account. For example, interest-rate is of course very important. The lower your interest rate, the lower your monthly payment will be and consequently the higher your positive cash flow will be. It’s very important that you only use amortizing loans on investment properties. Some people are attracted to interest-only loans on rentals because it increases your monthly cash flow; however, it’s very important to understand that because you’re making an interest only payment, you’re not reducing the principal balance at all. You could make payments on that loan for six years and your principal balance would be the exact same as the day it started. For this reason, I personally have only used 30 year amortizing loans on my properties and I would recommend all investors do the same. Another important detail: when I was buying my rental properties, I was refinancing them with 30 year fixed amortizing loans. Every property that I refinanced, I limited the new loan to the amount to what I had spent on the house. I never refinanced the house for more than the amount of debt although that would’ve been nice because it would’ve put some extra cash in my pocket. At the same time, I was watching other real estate investors refinance their properties and attempt to “cash out” as much as possible. Cash out means that you refinance the property for more than the amount of good debt that you have on the house. The investors that were attempting to maximize their cash out, of course, had a large amount of debt on each investment property. The large amount of debt meant that their monthly principal and interest payment was significantly higher than mine. As the years passed and the economy real estate market got tough, most of those investors lost their investment properties to foreclosure or short sale. They lost the long-term benefits of those rental properties. Because I never attempted to cash out when I refinanced my rentals, my monthly payments remained affordable even during the downturn in the economy. Consequently, I’ve been able to hold onto all of my rental properties. My philosophy of using other people’s money, in this case the bank money, to build my wealth is still on track for success. 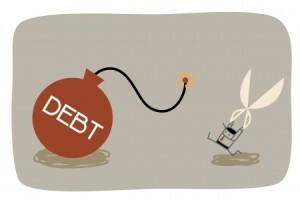 Back to Dave Ramsey’s principles: carry as little debt on each property as possible. I’m sure Dave would agree that cashing out on a rental property is a bad idea. Unfortunately, today in 2013, there are not many opportunities to get loans from banks on investment properties. I have found opportunities with private lenders who will lend you money to buy investment real estate. The same principles hold true. It is important that you make both interest and principal payments even if you are using a private lender. My recommendation is to understand these concepts so that when banks start lending on investment properties, and again you will be prepared to use the banks money the smartest, most efficient way possible to build your rental portfolio and prepare for retirement. Don’t fall into the trap of attempting to cash out on your refinances to put a little extra money in your pocket. You need to be prepared to earn an income enough to pay your monthly debt and manage your lifestyle, while your rental portfolio properties have good debt on them. A great way to look at it is to have your tenants paying your mortgage for you. It is a long hall to pay out the 30 year mortgage on an investment property and you have to stay optimistic. It really does help to look at it as if you own the investment property, but your tenants are paying the mortgage for you. You have to think positive and know that you will go through good times and bad times. Be prepared to live lean during downturns of the economy. Set money aside during the good months.